On Friday, April 18, Bishop Iker welcomed the Rt. Rev. 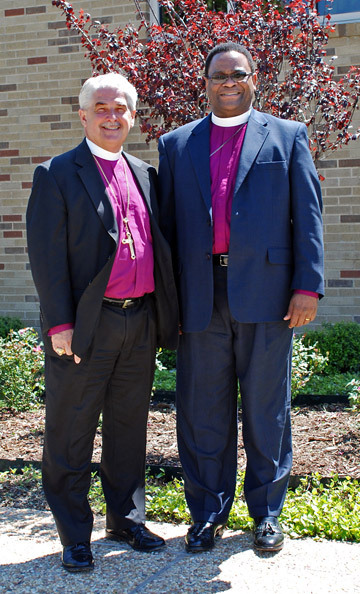 Dr. Valentine Mokiwa, Bishop of the Anglican Diocese of Dar es Salaam, to North Texas. Bishop Mokiwa attended Virginia Theological Seminary; at the time of his consecration in 2002, he was the youngest bishop in the Anglican Communion. The Diocese of Dar es Salaam operates outreach programs in the areas of agriculture, education and health care. Diocesan savings & loan and vocational training initiatives are in development. In February, Bishop Mokiwa was elected to succeed the Most Rev. Donald Mtetemela as Archbishop of the Province of Tanzania. He will be seated in the cathedral at Dodoma, the capital city, on May 25. Your prayers for his continued ministry and for his family are requested.